Hello Readers! We hope you’re ready for another weekly blog post because it’s another one we hope answers some of the questions we often get asked, this time it is the turn of the Eames Lounge Chair & Ottoman. The Eames Lounge Chair & Ottoman barely needs an introduction with even those who have no idea what it is called will still recognize its unique form and stylish good looks. At our tradeshows, they always catch the attention of on-lookers and we don’t think that’s just a coincidence! We do get asked questions though, with the most tending to be surrounding the confusion of who is Vitra and who is Herman Miller, which of them is authentic and why are their lounge chairs slightly different? As a result, we thought this blog post will be insightful as it will answer some of these questions. 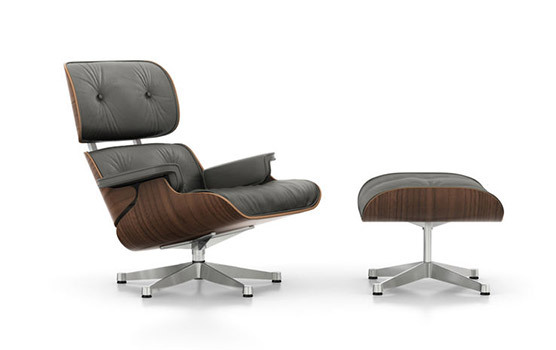 The famous Eames Lounge Chair and Ottoman was released in 1956. It's said that Charles Eames wanted the chair to "Fit like a baseball glove" and wanted the chair to provide that welcoming snuggled feeling as soon as you sit in it. It's sophisticated look certainly matches its extremely comfortable high-quality materials. The chair was commissioned by the Herman Miller Company and the design brief was set on creating something of luxury. The final design would not disappoint, and Herman Miller has continuously made them ever since. 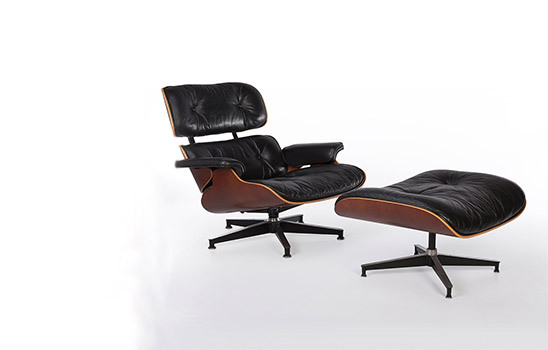 More information about the Herman Miller lounge chair and Ottoman can be found in the Wiki section on Eames.com under ‘Lounge chair’. The demand for new and exciting design was certainly not limited to the US and it was clear that Europe could provide a fantastic marketplace for the furniture of Charles Eames, as well as others. 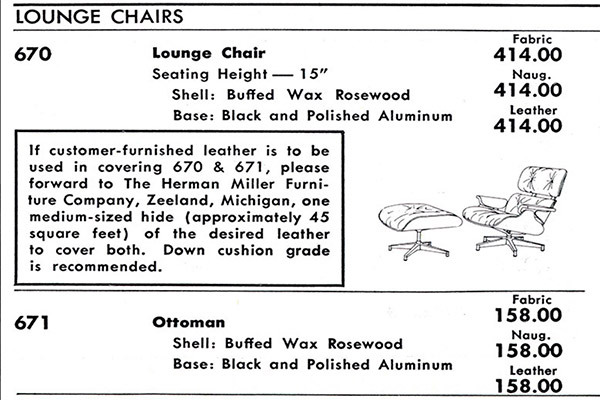 Rather than attempt the costly and lengthy process of setting up oversees, Herman Miller licensed the portfolio of several products (including the Lounge Chair) to a small number of European manufacturers with a pedigree for high quality, these included Vitra, Hille, Mobilier and ICF. As the decades went by, only Vitra remains and is the sole manufacturer of Eames products in Europe and the Middle East today. So, the question of which is authentic? Both are, both originally in different regions. And which is Herman Miller and which is Vitra? Let’s find out. The easiest spot is the base of the chair, the Vitra issue uses what is called the ‘Contract Base’, a wider one-color metal cross leg base with rounded ends and push in nylon feet. The Herman Miller lounge chair base has a 90-degree bend on each foot, more spider-like in appearance, and with screw in metal feet and a combination of black and aluminum plating. Another difference that can be used to differentiate Herman Miller and Vitra Lounge Chairs are, the Cherry Wood Veneer on the back of the Herman Miller lounge chair is much redder and lighter, whereas the Red on the Vitra lounger is darker. It can be difficult to tell the difference in color without them being next to each other side by side, but this is an important difference to take into consideration when you are looking to buy the one you want. It may sound obvious, but the labels found on the Vitra and Herman Miller Loungers will be a giveaway. The early Vitra chairs, made under license from Herman will have a label in Orange on white that denotes ‘Herman Miller: International Collection’ showing it is European made under license. And since the companies went their separate ways in 1984 each will have provided their own company labels too. Whether the lounger is supplied by Vitra or Herman Miller, it’s no doubt that they both provide extreme levels of comfort, due to their material. However, there is a difference between the foam used by Vitra and Herman Miller. The density of the foam is much harder for the Vitra loungers and this is due to European legislation on fire retardant foam. As we were saying early in the blog post, since they were both released, one of the main differences is the location both companies sell their items. Herman Miller Loungers are sold in the US, South America, and Canada whereas now, Vitra is known for selling their loungers in Europe, the Middle East, and Asia. There are no clear boundaries of course when it comes to vintage or second-hand pieces but this remains the case for new models. Due to Vitra and Herman Miller being separate brands, over time, Vitra has made some changes to their lounger, one of them being a slight difference in size in comparison to the Herman Miller version. The Herman Miller lounge chair has a height of 80cm, width of 83cm, depth of 83cm and the seat height of 38cm. This makes it slightly smaller than Vitra’s first edition lounge seating that came out in the late 1950’s. Vitra’s first edition lounge chair has a height of 84cm (seat height: 38cm), width of 84cm and a depth of 85cm – 91cm. Although the Vitra lounge seating is slightly bigger in size, unless the Herman Miller and Vitra lounge chair were placed next to each other, they look identical. Both companies have since released bigger versions of the chair for the ever-growing population, they are the ‘tall’ version for Herman Miller and the ‘XL’ by Vitra. 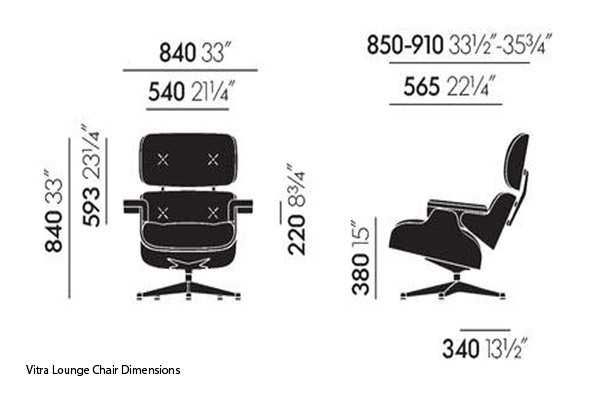 Now you know some of the differences between the Vitra and Herman Miller lounge chairs you should easily be able to tell which is which. Have a look at our Wiki which is designed to provide the history of the original design and there is a useful article about how to tell your Lounge Chair generation too. The Eames.com team will be at a number of trade shows this year, two of them being in Brussels and Amsterdam. We will confirm with you closer to the time about when they are and how you can go, along with the different types of Eames products that will be at the event. As always, a variety of Lounge Chairs will be present.